Codenvy is a cloud development environment for coding, building, and testing applications for Google Cloud Platform. In a recent LinkedIn survey, 1200 engineers indicated that they spend nearly ⅓ of their week administering their desktop. This includes configuring the IDE, build system, runtime, and plug-ins. By providing a cloud IDE that is pre-integrated with Google App Engine, we can change the developer workflow dramatically by automatically provisioning a cloud workbench that allows a developer to be immediately productive with fewer errors, and have a higher confidence that their application will deploy correctly to App Engine when pushed. 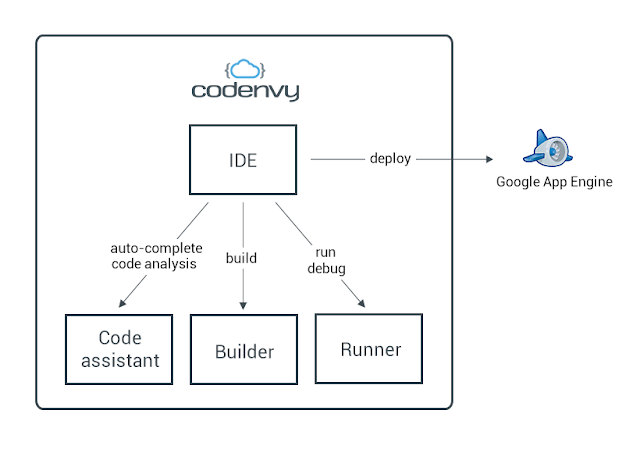 Each Codenvy workspace is comprised of an IDE, a code assistant service, a build system and a debugging runtime. These four components are integrated and decoupled to scale independently based on usage. This allows us to eliminate configuration needs while reducing compilation time and deployment time. Projects in Codenvy can start through a project creation wizard, or can be imported from a git repository. After coding operations are complete, code can be deployed directly to App Engine through using continuous integration post-commit hooks on git, or through a jClouds-based direct deployment connection to App Engine. The main challenge is setting up the development environment to match the production environment. Each language, framework and PaaS has its nuances that must be addressed. To reproduce the App Engine environment in Codenvy, we embed the Google App Engine SDK into the IDE (enabling compilation and auto-completion), and in the debugging runtime so that applications can be functionally tested in a cloud-local environment before being pushed to App Engine directly. The App Engine SDK is provided automatically by Codenvy whenever a App Engine application is configured in the project space. By providing this SDK in a cloud local environment, you save time by being able to do a high number of iterative changes to test functionality before pushing artifacts onto a App Engine instance. Since the deployment process of your artifacts onto App Engine has an uptake time, developers who need to make many changes would wait longer than making use of the cloud local environment that is low latency. First, we enable multi-cursor collaborative editing which is incredibly useful for pair programming, code reviews, or classroom teaching. This is powered by Google Web Toolkit, a framework to write optimized Ajax applications, and Collide, an open source collaboration system published by Google. Second, oAuth makes it possible to register with a Google account and start coding in seconds. Third, we support Chromebook development and have certified on Pixel tablets. Finally, we are preparing Android support in Codenvy. Check out this sample demo of an Android app built in Codenvy and deployed to Manymo’s web-based Android emulator: http://vimeo.com/66157251. Later this year, we will release production Android development support. In addition to editing, building and packaging Android applications, it will be possible to run them in the browser with a tenanted emulator. We’ll also be shipping an SDK that will allow the community to create programming language, deployment target, and framework extensions so that we can work to extend Codenvy to support PHP and Go in App Engine. Please visit Codenvy today and get started building your App Engine application. Full documentation and tutorials are at docs.codenvy.com. And you can vote for the features that you want here. And finally, do not hesitate to contact support with any questions at support@codenvy.com. Today’s post is from Tyler Jewell, CEO at Codenvy. In this post, Tyler looks at how you can leverage cloud based development tools to build applications for Google Cloud Platform.